30/1/19 – Lovely Mimi has found a new home as a direct result of being noticed on the Oldies Club website! Mimi is a lovely small brown Terrier X girl who is about 9 years of age. She is at Chilterns Dog Rescue Society, Tring, Hertfordshire. Little is known of Mimi’s history but she is proving to be a sweet girl who has easily made friends with staff and volunteers, and is adjusting well to life at the rescue. 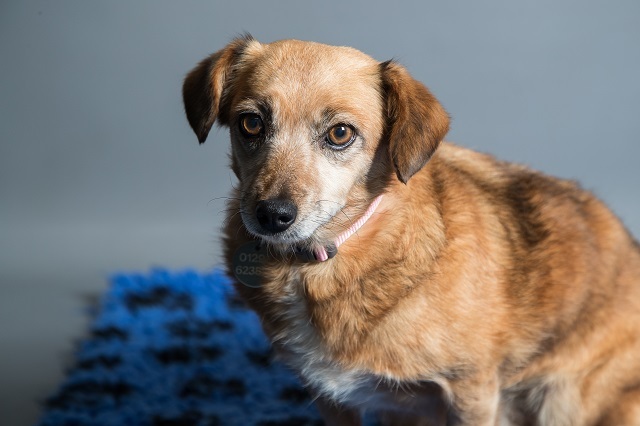 Mimi is quite shy so would like a quiet home, perhaps with a retired person/couple who will enjoy taking her for daily lead walks — she walks well on the lead and passes other dogs calmly. Mimi would like a nice comfy bed, a secure garden and lots of TLC while she gets used to her new life and starts to feel more settled and secure. Mimi has not lived with other dogs, cats or children, but, with appropriate introductions, these could form part of her new life. Mimi is generally fit and well for her age. The only veterinary information of note is that she has fixed luxated patellas (grade 4), but these do not cause her any problems or pain and do not require further treatment. Long walks are not recommended, and there is the possibility that arthritis may develop as Mimi ages which could require anti-inflammatory medication. Mimi is spayed. Could pretty Mimi come to live with you? Please mention that you saw Mimi on the Oldies Club website.